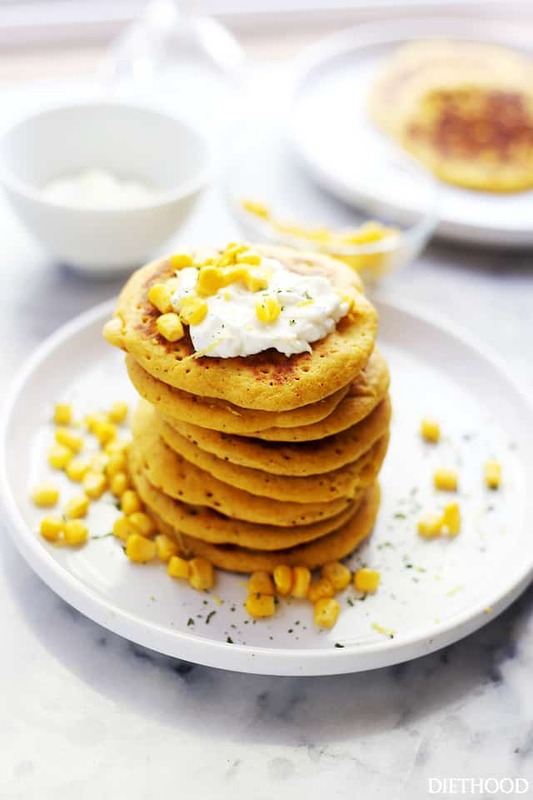 Cornbread Pancakes – Moist and soft on the inside, buttery edges on the outside, these pancakes will be your next favorite recipe! A.K.A. tonight’s brinner because, these pancakes swing both ways; sweet or savory! Hey Hi, buddies! How goes it? 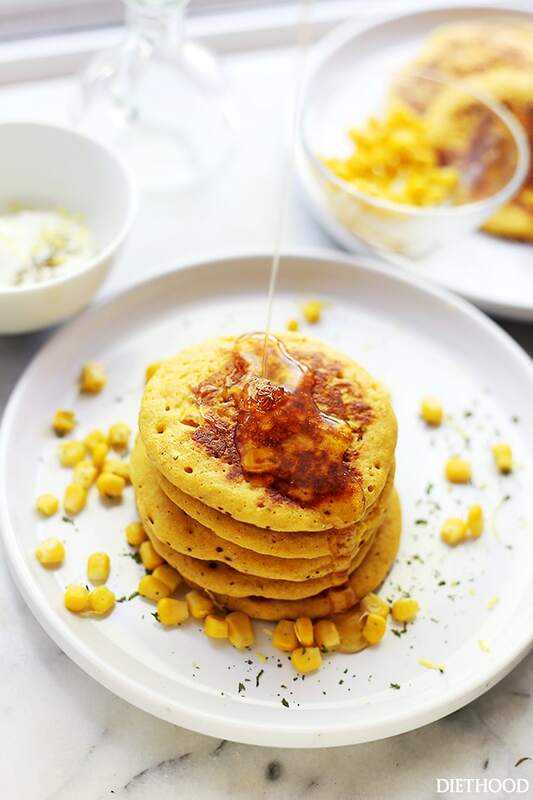 What do you think about welcoming September with a stack of Cornbread Pancakes? Yeah? I like it, too!! This is why we’re friends. So, I’m not sure if I’ve shared this tidbit before, but I make a lot of pancakes in my house. Well, more like a lot of crepes, but still, those are pancakes, too… But, anyways. A few weeks ago I had made the perfect cornbread ’cause, with all the Indiana corn in August, what else are you supposed to do? Exactly. 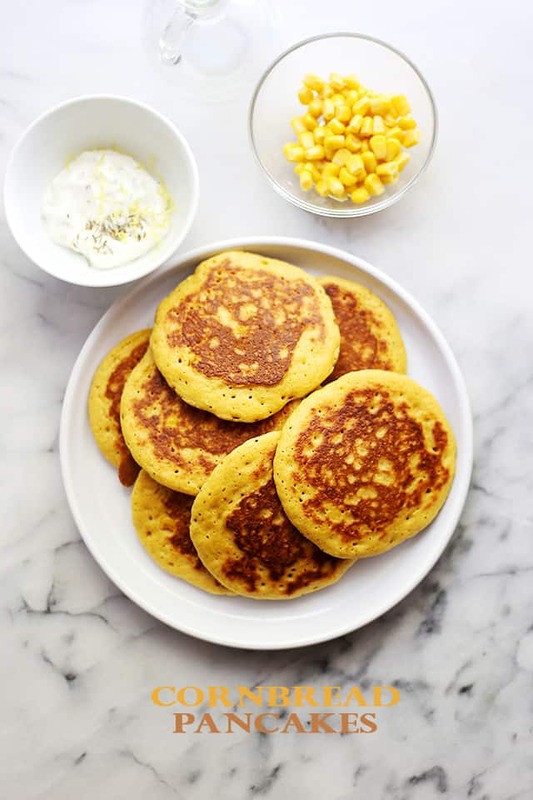 As I was chomping down (inhaling) the cornbread, piece by piece, I kept on thinking about how much cooler I would be if I had made cornbread pancakes, instead. P.S. It was a fabulous idea. All I could think of was fluffy pancakes with crunchy texture, and butter, and sour cream, and whatever else I could put on there. Couple of days later I took my idea to the kitchen and heaven happened. The pancakes were all hot and steamy, and the butter was melty, and the honey was running down the sides, and it was just… heavenly. But, wait! It gets better. Because I’m crazy for food that is served as brinner (breakfast for dinner), we enjoyed THESE pancakes (the ones that you’re lookin’ at) for supper and topped them with a sour cream herb sauce. SO GOOD! Okay, now I’ll stop talking. Okay, now let’s have brinner! Or brunch. Or both! I’m down with that. In a mixing bowl, combine the cornmeal, flour, sugar, baking soda, salt and pepper; mix until well combined and set aside. In a blender, combine the buttermilk, corn kernels, melted butter and egg; process until smooth. Pour the buttermilk mixture into the cornmeal mixture and stir to combine them. 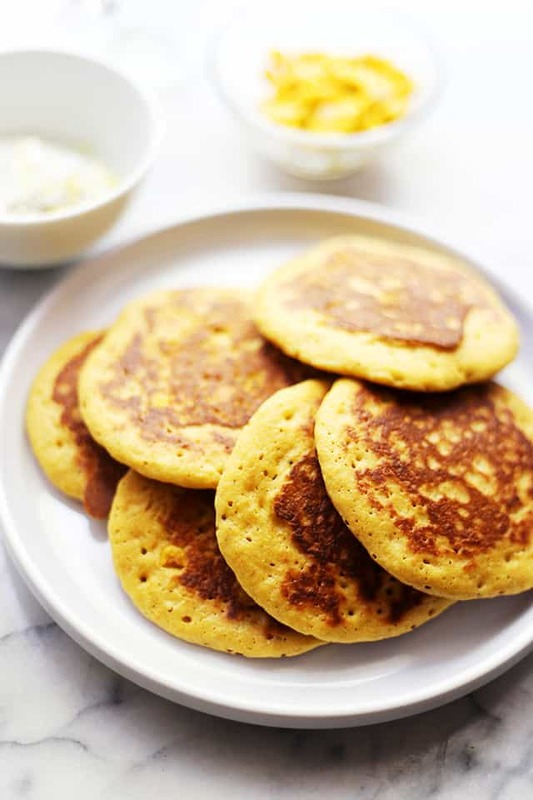 Pour about 2 to 3 tablespoons of batter per pancake onto the skillet and cook for 2 to 3 minutes, or until bubbles appear and edges are lightly browned. Turn pancakes over and continue to cook them for 1 to 2 minutes, or until the bottoms are browned. Transfer the pancakes to serving plates and set aside. In a small bowl, combine the sour cream, dill and lemon juice; mix them until thoroughly incorporated. Transfer the sour cream herb sauce to a serving bowl and serve with the prepared pancakes. How did you know I was craving pancakes?! 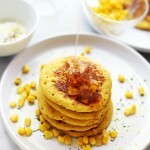 And cornbread pancakes are even better! I’d gladly eat these for breakfast, lunch or dinner – delish!